If this week were a pop song it'd be a Taylor Swift one: a star at the top of their game delivering something amazing that makes the world a more cheerful place. It's a week of new iPads and new Nexuses, of mad things from Will.i.am and new ways for players who want to play, play, play, play, play, play. 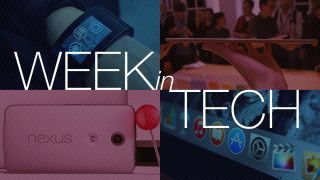 It's a particularly packed week in tech! The new Nexus 6 is the biggest smartphone Google has ever made, with a huge 5.96-inch screen. It's no slouch in the rest of the specs department either: there's a quad-core Snapdragon clocked at 2.7GHz and it comes in a choice of 32GB and 64GB models. That's the good news, but the bad news is the price: unlike previous Nexuses, which have been bargains, the starting price for the Nexus 6 is a whopping US$649. While Nexus smartphones are getting bigger, Nexus tablets are getting smaller: the replacement for the Nexus 10 is the Nexus 9, and we reckon you can guess just how big its screen will be. The 9 refers to the rounded-up 8.9-inch screen, and inside you'll find a 64-bit Nvidia Tegra K1, 2GB of RAM and either 16GB or 32GB of internal storage. It's a clear rival to the iPad Air, and the cheapest one will be $399 USD. Reports that Android 5.0 would be called Licorice proved to be red herrings: the L in Android 5.0 L stands for Lollipop, which is what we figured already. The name is ready but the OS isn't: while the new Nexuses will both run Android 5.0, they won't be doing it until November. Google really wants to be in your living room, and it's made all kinds of devices for it including the Nexus Q, the original Google TV, Google Chromecast, the new Google TV and now, the Nexus Player. It's an Android TV device with a quad-core Intel atom chip, and it's designed for both media streaming and gaming. It's a rival to Apple TV, the Amazon Fire TV and all the other TV streamers out there, and it probably rings the death knell for the Android-powered Ouya gaming box. It's October, and that means it's time for some new iPads. Apple has not one but two new tablets to sell you: the iPad Air 2 and the iPad Mini 3. If you were expecting radical new tablet tech you'll be disappointed, but the improvements keep what The Register likes to call Apple's "fondleslabs" current. Apple didn't just have new tablets to show off. It's updated the Mac Mini, and it's brought its retina display to the 27-inch iMac. Never mind 4K: Apple's desktop delivers 5K. Just don't look at the price tag. We've seen two very different wearables this week: we've been wandering around with the Moto 360 on our wrist, and we've seen the latest w.at.ch from will.i.am. The latter is called the Puls, and apparently it's a "smartcuff", which is a category we've just made up. It delivers "fashionology", which is a portmanteau will.i.am just made up, and is designed for people who don't care about looking "ridicularse", which… OK, we'll stop now. As for the 360, after a month of constant use we're a bit disappointed. An update has improved battery life a bit but it's still pretty bad, and while there's lots to like we just don't think it's a five-star device. It looks like the latest high profile hacking victim is Dropbox. The firm says it hasn't been hacked but hundreds of user names and passwords have been posted to Reddit, with the perpetrators promising to post millions more. Dropbox says that, as with a similar Snapchat breach, the login details come from somebody else's compromised service. If you're a Dropbox user you might want to enable two-factor authentication (2FA). Come to think of it, if you use any cloud service you should be thinking about 2FA. Bad news for Fitbit fans who expect to use their trackers with Apple's Health app and HealthKit framework: it isn't happening. The firm has confirmed that it doesn't have any plans to integrate with HealthKit, which seems an odd decision. We wonder, will Fitbit skip Google Fit too?